Go Go’ers, it may be a gazillion degrees outside but it’s time to put away the board shorts and get serious. Yep, it’s a seriously fun weekend. …and not the kind of magic where your clothes disappear. Accordingly, the three-day event at the Fais Do Do will have Variety Acts, Lip Sync, and Performance Games as well as a weird clown with a long, pointy tongue . Better wear your bulletproof smoking jacket. 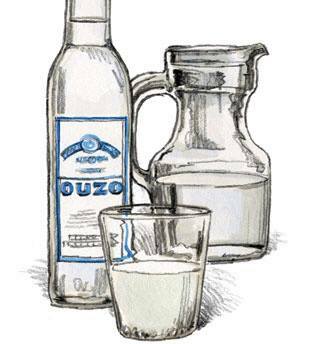 Do you want ouzo or vodka lemonade at the L.A. Greek Fest 2013? We all want to go to Greece. But until King Midas comes a’ calling (or your Mega Millions number comes in), you can at least dine like a demi-god at the L.A. Greek Fest 2013. The Greek-aganza, which runs Friday night to Sunday night at Saint Sophia’s Cathedral, features dancing, music, tours, and cooking demos; Rita Wilson and Tom Hanks are Honorary Co-Chairs. Despite the “Opas!”, the real draw is the food. Sample dozens of traditional Mediterranean specialties: grilled octopus, Loukaniko sausage, flaming Saganiki cheese, and honey donut puffs with Nutella. Yes, Ms. Go Go knows Nutella is Italian. Take it up with the Saint Sophians. Wash down souvlaki and mini-pita Gyros with Greek Mythos beer as well as American offerings courtesy of Angel CIty Brewery. Try an ouzo (or vodka) lemonade with Papa Cristo-style Greek street fries, sip retsina and Greek wine with marinated shoulder of lamb, or pair your kataifi, a nutty, honeyed angel hair pastry, with a traditional Greek Cafe Frappe with a Metaxa shot. Now we know the real reason it took Odysseus ten years to get home. So there you are, riding the Metro: bored, restless, and reading the continuing education ads. Then, the 17 poets show up. Sound like a scene from an indie movie? 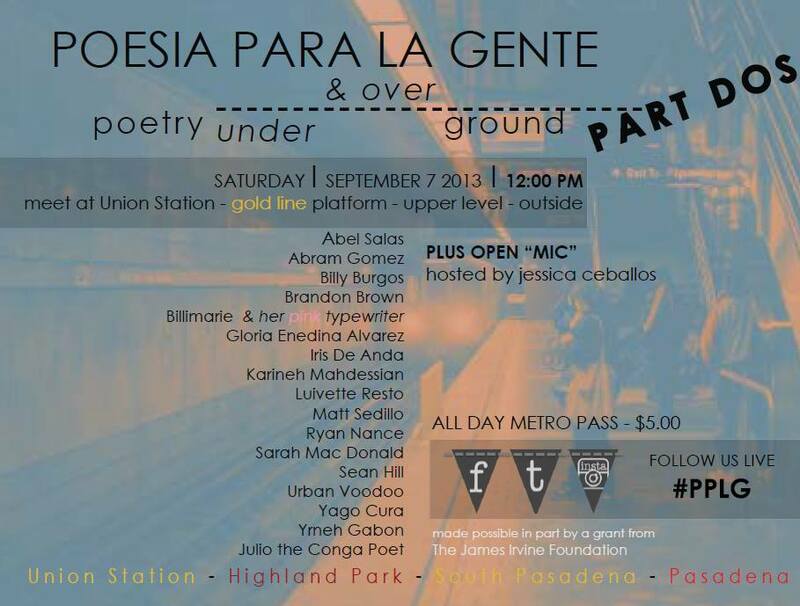 On Saturday, it could be your life courtesy of Poesia Para La Gente – Part Dos (Poetry for the People). Go Go’ers, this is not a June/moon/spoon event. Presented by Avenue 50 Studio and curated by fearless leader/poet host Jessica Ceballos, the poets — including include sign language interpreter Mona Jean Cedar, Julio the Conga Poet, and Billimarie and her pink typewriter– are fierce and on fire. You may miss your stop. If you want to be part of the happening — or read your own opus at the on-board Open Mic — be on the upper level Gold Line platform at Union Station; departure is at noon sharp. Ceballos will be live tweeting/Facebooking starting at 11:30 a.m. so you can follow the poets LIVE and/or hop on the nearest train by tracking them using the hashtag -> #PPLG. They’ll take you to the end of the line. You’ll go willingly. Planning to ride the rails with the poets? Please, stay with your group. The PPLG turns into Poesia IN TRANSIT and heads to (and and later performs at) the inaugural LAB•FEST. Writ Large Press is throwing the eleven hour bash to celebrate the Grand Opening of DT•LAB, an independent art, literature, music and creative space inside the Last Bookstore. All of those things will be happening on Saturday. Historian/poet Mike “the PoeT” Sonksen kicks off the bash followed by venerable L.A. literati Sesshu Foster and Luis Javier Rodriguez talking about Los Angeles writing past, present and future. 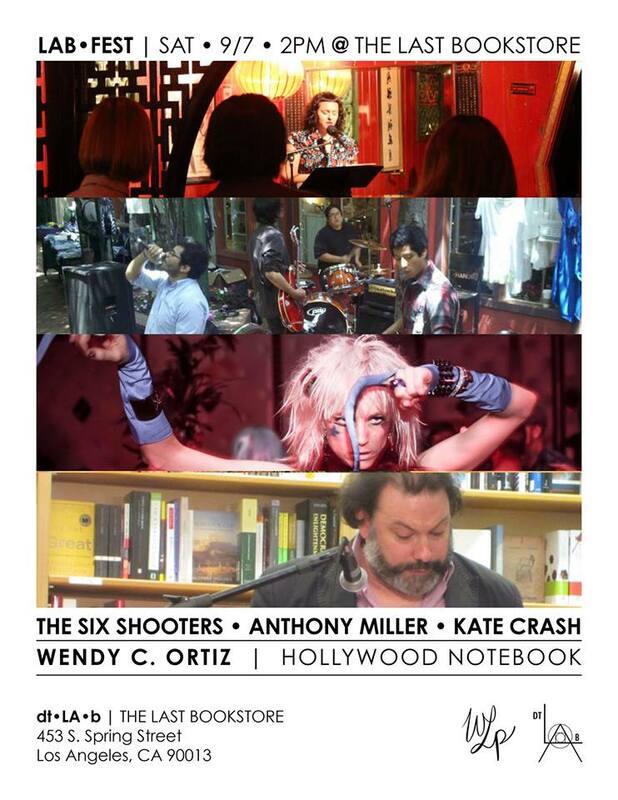 There will be Hollywood poets, alt culture darling Kate Crash, Emerging Voices, street artists, jazz and classical musicians, El-Haru Kuroi, and Grammy-winning, East L.A. artists Quetzal. Nothing like a Grammy winner to ramp up the party. There will be printed word-into-art , poetry-on-demand, and an on-site treasure hunt courtesy of artist JT Steiny. The only thing needed to complete the party is you.